Plot Outline: The world of freight handlers Wilbur Grey and Chick Young is turned upside down when the remains of Frankenstein's monster and Dracula arrive from Europe to be used in a house of horrors. Dracula awakens and escapes with the weakened monster, who he plans to re-energize with a new brain. 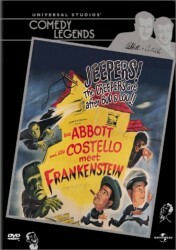 Larry Talbot (the Wolfman) arrives from London in an attempt to thwart Dracula. Dracula's reluctant aide is the beautiful Dr. Sandra Mornay. Her reluctance is dispatched by Dracula's bite. Dracula and Sandra abduct Wilbur for his brain and recharge the monster in preparation for the operation. Chick and Talbot attempt to find and free Wilbur, but when the full moon rises all hell breaks loose with the Wolfman, Dracula, and Frankenstein all running rampant.